It's been over a year since the last update in the Trappist Beer section. Today I have a beer for you that I brought back from Brussels last year; Zundert from the Trappistenbrouwerij de Kievit (also known as Brouwerij Abdij Maria Toevlucht). I can't wait to get into it! Firstly though, some background; The Trappistenbrouwerij de Kievit started brewing in 2013. The Abbey had been a Trappist Monastery since 1900, but had mostly been involved in agriculture. Due to spiraling costs, various agricultural ventures were discontinued between 1969 and 2009 and the final plans concocted to open a brewery at the Abdij Maria Toevlucht. They produce approximately 5,000hL of beer a year and make only this one variety; a Tripel. It's finally time to pour this beer and get into it! 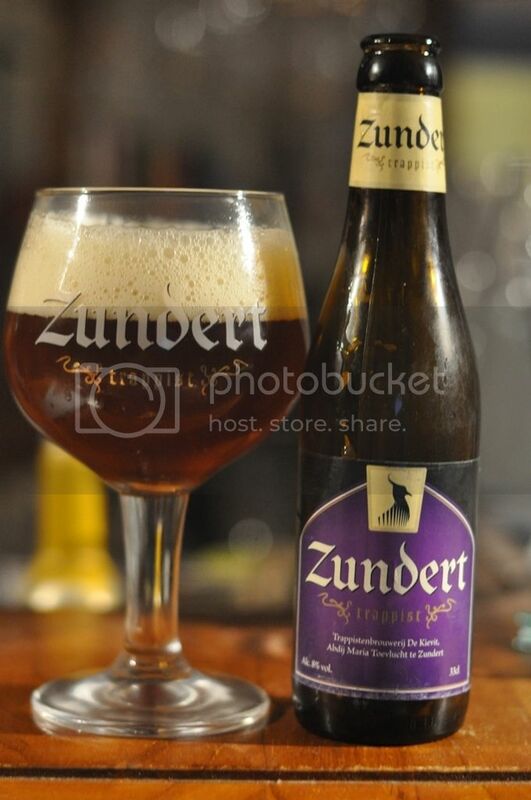 Zundert pours a deep amber, almost brown colour. The head was cream coloured, 4 fingers high and full of small bubbles. It has very poor head retention, with only a ring of foam and a tiny film remaining a few minutes after pouring. The pour of Zundert is certainly atypical for a Tripel, normally a very light coloured beer with a fluffy white head. Onto the nose and again it doesn't seem like a Tripel. The nose is yeast and malt driven, with Belgian esters, cloves and malt sweetness most prominent. As the beer warms there is some dark fruit aromas that become evident, while there is also a spiciness that I can't quite place. Unfortunately there is also some latent raw alcohol present, which does nothing for the nose and detracts a little from the experience. Zundert is an absorbingly tasting beer. At first it tastes like a relatively straightforward Belgian ale; with sweet bready malts, some banana, cloves and some dark fruits. Then it gets a little interesting; there's some lighter, bitterer fruitiness from some (not aged) hops, there's also a spice that I can't quite place. All of these flavours are a little light on, personally I'd like all of them to be turned up a notch or two. The first conclusion I will draw on Zundert; it's not a Tripel. I would call it a Belgian Strong Dark Ale, but it is certainly on the weaker flavour side of that style. That aside; what this beer is, is a nice easy drinking Abbey Ale. I would see this almost as an introduction to Trappist beers. It lacks the complexity of some of the more seasoned contemporaries, but it is by no means a bad beer. I can't recall seeing it around Melbourne, but certainly keep an eye out if this is your sort of thing.